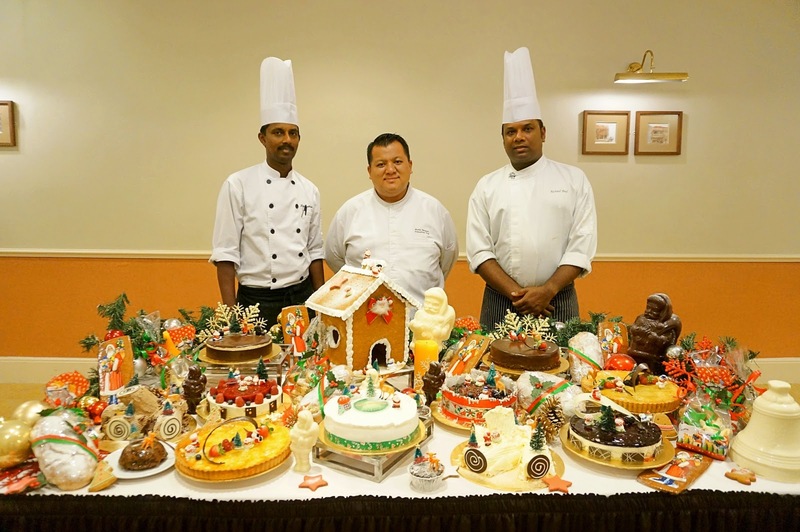 JJ IN DA HOUSE: International Buffet Dinner & Christmas Goodies @ Sarkies, E&O Hotel Penang. The hot dishes here featured variety of food from different region, and they run on rotation basis everyday so that their customers get to taste different dishes everyday. Crackers, one of my favourite! There are all sorts of sauce for you to go with grilled food such as lamb, scallops, sausages, salmon and many more. They also have their chef made satay, chicken and beef sausages, marinated beef, chicken or lamb. You can just order from the chef and they will grilled those food for you on the spot. This is one of my top favourite whenever I come to Sarkies for their buffet. Other dishes such as mixed vegetables, grilled potatoes are also available. They also have pastas available at this Pasta corner, you can just choose your favourite pasta, and also sauce of your choice. Then the chef will cook your pasta for you on the spot. Cheese Baked Oyster, simply delicious! Japanese sushi, Maguro Sushi and Unagi Sushi are also my top favourite of the night! There are few more new sections added into Sarkies, now also serving local dishes like curry noodles, char koay teow and etc. They also have Indian Corner which features Tandoori, Briyani rice and other Indian dishes! Their mussels were quite fresh, best have it with Wasabi Mayo to me. Other Poultry meats would be grilled chicken, Lamb, and Beef as well. And so, we begin to enjoy our feast. There are too many choices that we can't even decide where to start. I will usually start with the Fresh Seafood or Sashimi first. Other than the buffet itself. E&O Hotel also come out with their Christmas Goodies, which is now taking orders from the publics, but you can collect later when it is near Christmas Day. Their Christmas goodies would be inclusive of few types of cakes like Mont Blanc, Chocolate Truffle Cake, Christmas Yule Log Cake and etc. Christmas Stollen, a must for this festive heh? Look at the Ginger Bread House! Even the Christmas Pudding is so cute with simple decorations! Salmon en Croute Set, which is a baked salmon fillet wrapped with puff pastry. Selling at only RM 425.00++ per set. Chloe and I with the whole lot of yummy Christmas goodies! The professionals behind the scene, thanks to all the chefs who provided a chance for us to look at all these cute Christmas goodies! 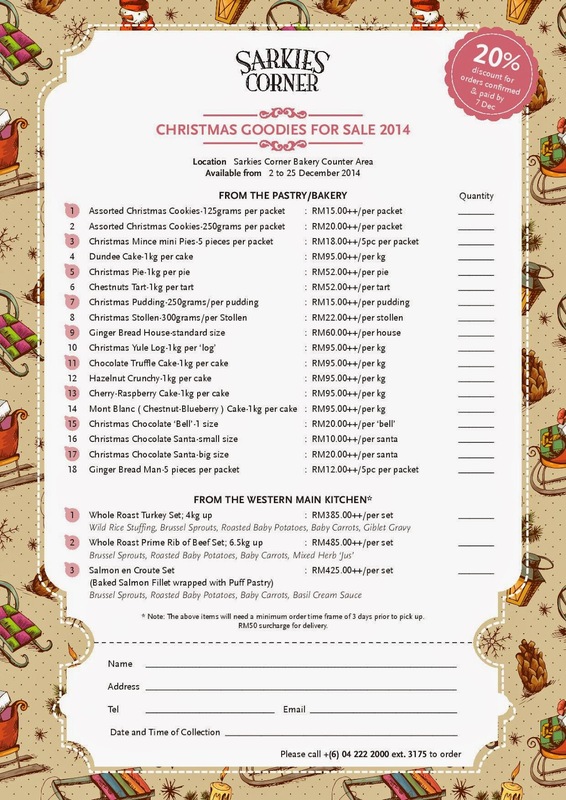 The order list for Christmas Goodies in E&O Hotel. For orders before 7th December 2014, customers will be entitled for the early bird promotion of 20% discounts. But payment must be made together with the order. International Buffet Dinner @ Sarkies, E&O Hotel Penang.